Welcome to Grizzly Cove, where the sheriff has more than the peace to protect. The proprietor of the new bakery in town is clueless about the dual nature of her nearest neighbors, but not for long. It’ll be up to Sheriff Brody to clue her in and convince her to stay calm – and in his bed – for the next fifty years or so. Is the wild cougar about to be tamed? Matt Redstone is always up for a lark, but lately, the youngest Redstone brother has grown envious of his brothers’ marital bliss. 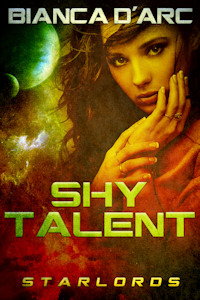 When Matt is sent to Northern California to work out logistics on one of his family’s projects, he finds himself working with a woman he’s met before. A pretty little Florida panther named Morgan, who is as lovely as she is brilliant. Matt and Morgan must work together to uncover the sinister plot and those who would trigger a very un-natural disaster in order to bring an ancient evil back into the world. Can they avert catastrophe while finally acknowledging the pull of the bond between them? Or will it all just be too little, too late? A blind date turns magical when a werecougar and a witch bridge the chasm between their very separate worlds. Valerie Faber comes from a long line of mages of incredible power. Clan Faber is so skilled, they teach other mages how to use their abilities. All, except for Valerie. What little power she does have seems to be in the realm of housepets and familiars. Not very useful to a Clan used to epic abilities. Keith is a werecougar with a mixed heritage that makes him a little different from the rest of his Clan. 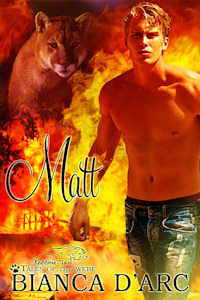 He’s overcome it all to become the local Alpha, but he hasn’t yet found the woman who can make him purr in human form. 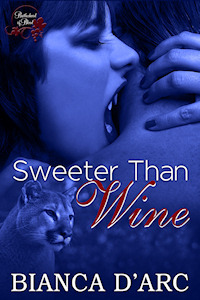 A blind date brings them together, though rarely do shifters mix with mages. After a tempestuous night together, Keith is hot on Valerie’s trail – with the help of her feline friends and a little interference from a well-meaning family member. He’ll do anything to keep Valerie in his life, including stalking her in Clan Faber’s magical fortress.